ThaiTourismGuide – Know more about Thailand before you travel through our articles on attractions, reviews and travel tips. Read all about our special highlights in the reviews, findout what are the latest attractions and learn what to prepare and expect while traveling in Thailand. It is a consumer’s market in Thailand, and none more obvious than in Bangkok City. Shopping seems to be a favourite past time not only among the Thais but apparently even tourists who would surprisingly go out of their way to try out a new shopping and sightseeing experience in Thailand. There are street markets, floating markets and of course the night markets. The latter being a little less available as the space designated are rather limited within the city. Night markets are only open on the nights leading up to the weekends very similar to the floating markets or Chatuchak Market. These market places are one of the tourist attractions for Bangkok City, however there are very few tour agencies that actually offer these night market routes as part of their tour attractions in Bangkok. Therefore if you are visiting the Big Mango and would like to visit one of these night markets, you would have to make an effort to find your way there. The two main night market attractions are in Rachada Road and in Srinakarin. The Rachada Night Market is a little more accessible but is yet to be completed. It is reputed to be the biggest night market in the city and within the easily accessible areas of RCA, which is one of the main night entertainment hot spots and the MRT services. The other night market, which is in Srinakarin is a little further on the outskirt of the city and used to be at the old railway lines in Chatuchak area. It is known as the Talat Rot Fai (“talat” meaning market and “rot fai” means the railway in the Thai language). What is it that attracts throngs of people to a night market or is it simply because people just like to shop? Unlike the other markets, in a night market you can shop in relative comfort even though it is crowded and do not have to bear the heat of the day as night markets are in an open space which also means that during the rainy seasons, business would be a whole lot slower! The night markets in Thailand are a variety of goods and food that appeal to a good cross section of the shopping taste. You can find anything from brand new clothing, second hand designer goods, old vintage toys and décor or even second hand clothing and toys. The Talat Rot Fai in Srinakarin has a good blend of up market retail shops as well as restaurants and cafes which makes it a pleasant place to hang out for those who are tired of shopping. It is a far better environment compared to the original night market which was in a dirt road back area, always muddy and dark. Night markets also offer a good bargain opportunity for those who like to haggle at prices. The night market concept offers a business opportunity for small scale proprietors that are keen to do a little side business over the weekends for extra income and this is where you can find many unusual items for sale which are homemade or customized and not found in department stores or big shopping centres. While you are at Talat Rot Fai night market, try one of the attractions here which is a big bowl of porridge with all the trimmings on it boiling hot in a clay pot at your table! You will not find this anywhere in a shopping centre or even at a food court and one pot serves up to three persons with plenty to spare even for> those with a big appetite. Shoppers who are keen on collectibles, this is a good place to start looking for them. Some vendors at the night markets have a good collection of vintage tin toys, obsolete comic books and collectibles or even antiques which are going for a steal. You just need a sharp eye and a good sense of what is vintage and a collectible. You can even buy some good car, bike and bicycle parts here if you like something unusual. These night markets normally start around 4.00pm and go on till 3.00 am in the morning which gives you ample time to mooch around especially if it is one of those sleepless weekend nights or you happen to be a night bird and prefer nocturnal activities. Tourists will have a fun time eating and shopping their way through or even taking some great photos of things that make up the culture of the urban Thai shopping adventure. If you are not sure what to do on weekend evenings in Bangkok, add the night market adventure into your list of sightseeing in Bangkok Experiences, hop onto a BTS train and head for On Nut station and grab a cab to Talat Rot Fai or take the MRT to Phra Ram 9 and walk from there to the Rachada Night Market. The hustle and bustle of Thailand’s night markets can best be described as an eclectic shopping adventure of local smells, taste, sight and sound. The familiar Thai greeting of “Dai na kha?” akin to “Anything?” will see you ending up with an item or two into your shopping bag! So the next time you are in Thailand, especially Bangkok, rather than just heading out to Chatuchak Market or the famous floating markets, try a night market experience in Bangkok and tell us what you think! Sightseeing on the beach in the wonderful summer cross Phuket , Pattaya,Koh Samui Pang-Nga and Huahin is a holiday paradise for those who enjoy a quiet holiday or a smashing wild time. They are extremes on both ends of the holiday spectrum; you can get lost in a private beach or be the one to litter the beach after a wild hangover party. Backpackers out for a good time will not be disappointed and for the more sedate tourist you can always stay away from the crowd in the more secluded beach front resorts. Even adventure goers will have a field day in the jungle interiors of the island. Let’s get stared with the hot summer. “Songkran” is the Thai traditional New Year and an occasion for family reunion. At this time, people from the rural areas who are working in the city usually return home to celebrate the festival. Thus, when the time comes, Bangkok temporarily turns into a deserted city. The event will be divided into Four Zones, each with demonstrations of culture and cuisine. Visitors will get the chance to take part in traditional activities, try food associated with Songkran and enjoy entertainment and cultural performances. The Bangkok Songkran Festival is at its biggest and most fun at the large outside area in front of CentralWorld Shopping Complex. It is aimed at young and young-at-heart music lovers looking for a memorable way to spend their Songkran break. Here you’ll find a wonderful balance of water-based fun and sacred ceremonies that show the religious importance of this festival to the Lanna people. One of the most popular events is the sand pagoda building contest in which families compete to make stunning designs. Thailand’s former capital – Ayutthaya is another place worth visiting during the Songkran festival. One of the most fascinating ways to celebrate a Songkran near Bangkok is by visiting Phra Pradaeng, where the local people observe Mon ceremonies in a traditional way. 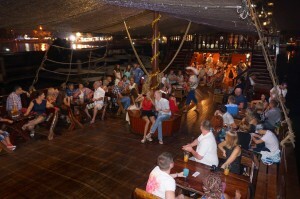 Admirallica is the largest and most comfortable cruise vessel in Pattaya! 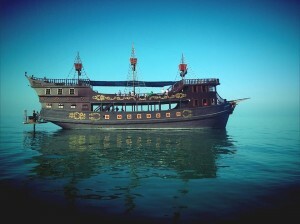 Introducing Admirallica, this grand pirate ship is now available in Pattaya for day trip excursions. 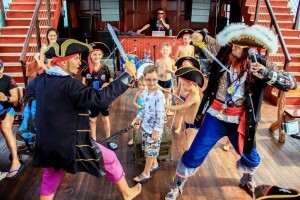 The mighty galleon offers a truly unique experience and is totally family friendly, with on board entertainers performing pirate shows and catering to all guests, whatever your needs may be. Admirallica guarantees maximum comfort with easy access to six bathrooms equipped with showers, a large dining area with ample seating to sit down and enjoy the delicious meals prepared by our chef. 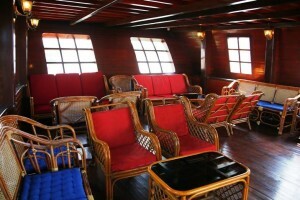 The upstairs lounge area is the perfect place on the boat to sit and enjoy drinks from the bar, with draft beer available as well as spirits. The bar is covered and shaded offering a lovely breeze and is furnished to amplify the comfortable and luxurious style that flows throughout the vessel. The second deck is also occupied by the DJ booth and dance floor, while the upper decks are perfect for relaxing and catching some sun on the lounge beds. The whole ship offers fantastic view points and ideal photo opportunities, with our on board photographer you can capture every moment! The islands around Pattaya offer gorgeous clear waters to swim, and all guests can enjoy the water from the swimming platform at the rear of the ship. Should any guests wish to venture to the beach, our tender Admirallica 2, will deliver you safely to the shore. 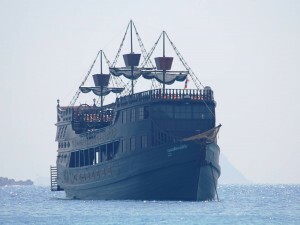 Admirallica is the finest touristing vessel in Pattaya, safety and customer satisfaction are top priority and our staff are on hand to ensure you take full advantage of what the ship has to offer. Teddy Bear Invasion In Pattaya! Somewhere in our childhood, some of us had a teddy bear or two. If you love teddy bears and want to see one of the largest collection of these lovable and huggable childhood icons ….head on over to the Teddy Island Museum in Pattaya! We guarantee even your kids will find this more to their taste than Walking Street just down the road. At Thaitourismguide we believe that fun should not be limited to adults only, unless of course there is the child in you. Imagine rooms full of these cuddly bears in all shapes and sizes. it will take you a good half afternoon just to get through the whole space within this museum. Conveniently located along the main shopping and entertainment street of Pattaya on Beach Road, it is easy getting to Teddy Island if you are staying in any of the many hotels in this area. This is one of the new attractions in Pattaya that would be fun to explore especially if you have been to Pattaya a few times or have children tagging along. The museum is the brainchild of a Korean family that makes teddy bears for toy shops around the world. Thinking of what better idea than to have a place where all types of bears can be displayed in imaginative settings for the amusement and entertainment of visitors to Thailand, the Teddy Island Museum was created. Boasting more than one thousand teddy bears specially created for the museum, one can also have a good time taking some interesting pictures within. There are two levels in the museum but unfortunately no little cafeteria inside where you could have refreshments. While teddy bears may not be for everyone but some of these bears are very cute and one can appreciate the art work that has gone into designing the settings for these bears. Walking into the museum on the third floor, you are greeted by a family of bears in their actual life-sized pose. Beyond this point will be bears galore in Egyptian headgears, Indiana Jones style and even Bat Bear and Dracula! The first bear chamber is dedicated to Egyptian and somewhat Mayan type bears. Of interest here is actually the sculpted fiberglass bears with their colourful costumes. There are also bears of variable sizes placed on shelving, decorated bears and a few interesting mummified bears. See “Bearcula” in the bear cave hanging from the dark corners of stalactites and stalagmites. He comes with a few minions to scare the bear out of you! Next up is a Jurassic Park adventure. There is a 3D tunnel here for an interesting photo shoot of escaping from the jaws of an ancient croc. You might want to try that picture snapping moment here. A little further up is good old T Rex and his companions all giving the bear friends a ride? T Rex is an interesting and imposing figure in this room and there is a dinosaur eye starring back at you from a corner. Unfortunately the bears were not too outstanding here in this room and overshadowed by T Rex and his friends. However the archaeology room is a little more interesting. Indiana Jones styled bears investigating old fossils and ruins were fairly interesting. Conveniently located in each of these rooms are pose able bears where you can take some really cute pictures with bigger-than-life bears. There are also a few other stuffed toys mostly in the Safari World section. Here there are hippos, giraffes and other animals mostly for the entertainment of children. There are many more sections to this museum, such as Underwater World with a huge pink whale on display and mermaid styled bears, Space Exploration with astronaut bears, the Movie Fantasy Room with bears from different character movies such as Obi Wan Kenobi, Yoda and Darth Vader from Star Wars, Superman and even other Marvel Super Heroes. Little girls would love the Fairy Tale room with winged ponies and Fairy Bears. There is even a tree house you can climb up to much like what one would have loved to have as a child and slides to slip down from the tree house. Under the tree house is a dream bedroom for the musician in you with a self-playing piano. While a Teddy Island Museum is not for everyone, it is however a great place to add on to your itinerary for sightseeing in Pattaya especially if you have children or just love teddy bears. You can book tickets to Teddy Island Museum early from the Thaitourismguide website and plan your trip to Pattaya early so that you will be able to see as many attractions in Pattaya during your stay. The location of Teddy Bear Island on Beach Road is near to other attractions such as Alcazar Caberat Show and the renowned Tiffany Cabaret Show. Other attractions along Beach Road in Pattaya is off course the infamous Walking Street with their nightlife and Go Go Bars, seafood restaurants and the Bali Hai Pier which has ferries to Coral Island or better known as Koh Larn. Typical bookings to Pattaya would include sightseeing to Koh Larn, a visit to Teddy Island Museum and probably a dinner and show in Pattaya from one of the many famous theatres. 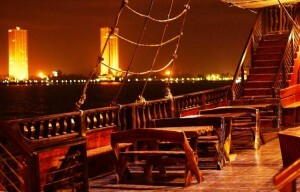 Most of the admission tickets for shows in Pattaya are available via the Thaitourismguide travel website. So if you are looking for something different to do in Pattaya and have been here a few times but want an unusual place to visit in Pattaya, head out to Teddy Island Museum for the afternoon. Remember to bring your camera along for those few good shots! The province of Chonburi is located just a mere 45 minute drive from Bangkok City and the most famous place in Chonburi is Pattaya seconded by the beach of Jomtein and Coral Island. This does not mean that Chonburi is any less exciting compared to the other places such as Bangkok, the islands of Phuket, Koh Samui or even Chiang Mai! Adventure and sightseeing are still the highlights of this province, plus the added allure of Pattaya City, also dubbed the “City of Sin” in many ways! The tragedy of 2004 will not be forgotten in the minds of many but eight years later there are hardly any signs of reminder in the city of the Great Tsunami. Phuket is back to the bustling beach city it once was and even better than before. Very much, like a Phoenix rising from the ashes, so has Phuket risen from the mud and devastation. Phuket is now the all-night-long party city of the Eastern side of Thailand. Half-naked party animals are a common sight every weekend and during festivities but it seems like Phuket has everyday weekends and festivities! Patong Beach is the height of a pleasurably decadent lifestyle. You can find anything here from shopping to all-night hedonistic parties. Phuket also invites travelers of all budgets from the budget hitchhiker to the infamously famous! Much as we would like to make a direct comparison between the two venues on Phuket Island it would be very much like comparing an apple to a pear. There is a vast disparity between the two as both have very unique highlights about their performances and type of venue. Where one is a whole theme park, show, shopping and dining venue the other is pure showmanship performances and both are just as popular as well as “must see” attractions while on Phuket Island. The Phuket Fantasea show is more than just a normal cultural show per se. The whole area of the location includes an amusement park, a shopping area, a massive theater, theme park and several restaurants. Whereas The Simon Cabaret show is very much a Vegas style performance but performed exclusively by the transgender community or better known as “Ladyboys”. Most large cities and Bangkok not being the exception is host to one of the largest indoor oceans in a thriving city scape. at the lowest level of Siam Paragon in the heart of Bangkok has seven interesting zones for you to explore including an awesome 5D cinemas which will blow your mind. With the Madame Tussauds Wax Museum just practically next door, you could spend a half day over there and another half day at the Sea Life Bangkok Ocean World for a great whole day outing plus plenty of shopping and eating all along the way.